...And then we went shopping at Target but that's a blog for another day. I realize that is a bit of a bold statement, but hear me out. I love Christmas. I don’t just love it but I lose myself in it and feel no guilt about it. It comes to me naturally because my two first great male role models were incarnations of Santa themselves. As I look back over past Christmases, I always remember seeing the big guy and my grandfather (Pop), laughing, chuckling, and conspiring to give us a better Christmas than the ones previous. They did. This past year has possibly been one of the best Christmases I’ve had since I was a kid. After a long illness due to my kidneys, a divorce, loads of anger, Dad and Belle’s passing, I kind of lost my way but have come out the other side with a Zen-like appreciation for this time of year. I’ve always enjoyed the Holidays but I am now seeing them through new and brighter eyes. Call it a Yuletide Lasik. My Dad always used to light up in telling the story of how my Pop loved the Holidays so much that during the Depression, Pop drilled a hole in the apartment they were renting to make a pond for the Christmas Village he built from scratch. He couldn’t do much in the way of presents but figured he could use his natural talents to make something special for his wife and my uncle to enjoy by their tiny tree. He did. We still talk about this and have tried many attempts at our own Christmas Village. None seem to rival the homemade masterpiece constructed on Bull Street back in the 30s by my Pop. My Dad got so into the holidays that we’d go two hours out of our way on the seven hour car ride to Savannah from Young Harris to mail the family Christmas cards from Bethlehem, GA. As a teenager, I hated it and would get so frustrated with him. I’d always point out that no one really looks at a stupid postmark anyway. As I’ve gotten older, I‘ve finally come to grasp the real meaning of this time of year and why it’s so special. Christmas is universal and is relatable to everyone on some level. We tell of traditions and stories about our pasts to our friends, families, and co-workers and we all get it. It might be one of the most easily relatable subjects on the planet.
. I am about to embark to my least favorite place in the world, the Mall. We are taking the kids to do their Christmas shopping. We’re taking Ronnie and Jude to pick out gifts for Kim. My job is to help the kids pick out gifts for their mom. I should be grumbling but I keep looking at my clock because I am so excited to go. 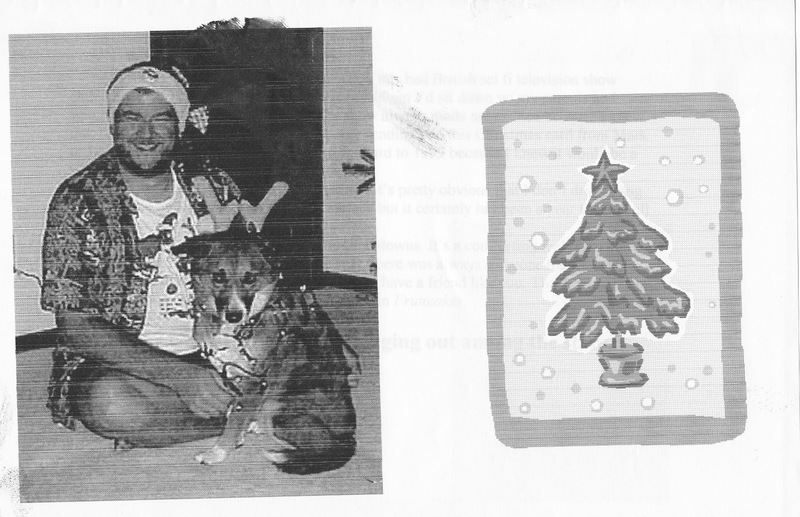 from the Robby & Belle Christmas Card series, 1999 ed. Belle and I used to do our annual Christmas card every year while she was alive. I’d always figure out clever ways to put ourselves into famous Christmas specials with me in my Green Santa hat that Lori Burnette made and the infamous reindeer antlers Janelle law gave Belle. I always tried to keep them light and funny and they were. While living in Snellville, I realized that Bethlehem, GA was just 15 minutes away. Guess who started mailing their cards to get that damn Bethlehem postmark? Right again, Big Guy. Dammit….. The way I've always heard it was that as long as you believe there's a Santa Claus, there will be.